The Greeley post-office, located in Park Place block, is one of the institutions of the city, and one of which its people are justly proud. The office is furnished with eight hundred boxes, all of the Morris keyless pattern, of steel, nickel-plated, each having a combination lock, thus doing away with keys. The uniformity in the boxes gives to the place a neat and attractive appearance. This year Greeley was created an office of the second class, its business having increased to the requisite amount. 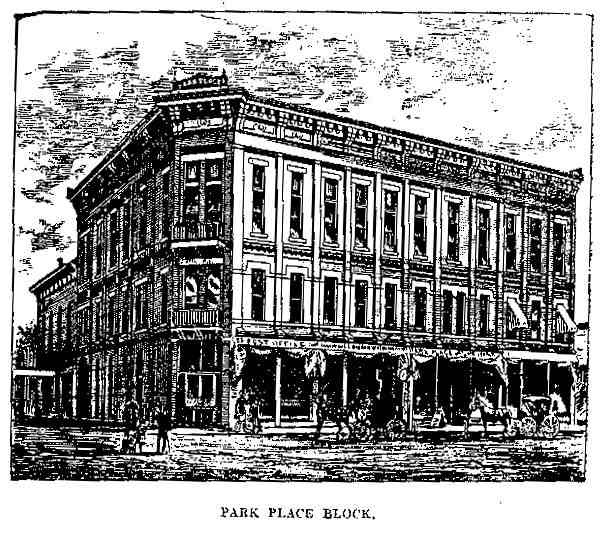 corner of the first floor of the Park Place Block. Of registered mail the number of pieces received during the same period was 139, as against 90 in 1886; and 157 pieces were dispatched, as against 107 in 1886. According to the above table, the increase in the number of letters received has been about 35 per cent, and in those dispatched 44 per cent. While for the same period the number of papers, magazines, etc., coming to the office have increased 50 per cent. The latter is a remarkable showing. This increase demonstrates conclusively that the population and business of the city is growing steadily and satisfactorily from year to year. R. H. Johns is the present obliging and efficient postmaster, assisted by Mrs. Johns and by George E. Duvall. - David Boyd, A. M.
Editor's note: The settlement of Greeley, Colorado, in 1870 was led by Nathan C. Meeker, who was the agricultural editor of the New York Tribune. Meeker promoted the formation of the Union Colony, one of a number of Colony groups which were formed after the Civil War for the purposes of populating the western United States and taking advantage of the provisions of the Homestead Act. Horace Greeley to whom was incorrectly attributed, "Go west, young man, go west" and who published the New York Tribune was happy to promote such a group. The Union Colony chose land in north central Colorado Territory for the town and colony. Nathan Meeker was subsequently killed in an Indian attack in September, 1879, at the White River Agency in northwestern Colorado where he had been assigned after being appointed as an Indian agent. 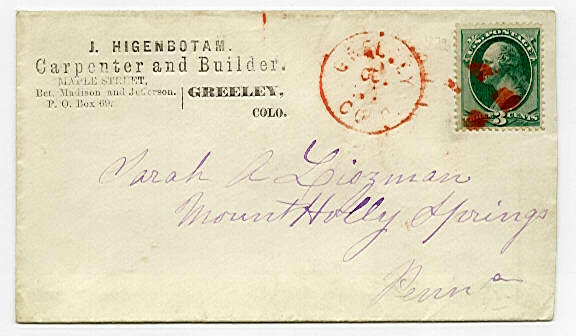 The Greeley post office was established April 21, 1870. Colorado became a separate territory on February 28, 1861 Colorado became a state on August 1, 1876.